An operative disturbed a section of ducting where he was working. He was unaware that a piece of concrete was on top of the ducting and due to the movement of the ducting, the concrete rolled off. 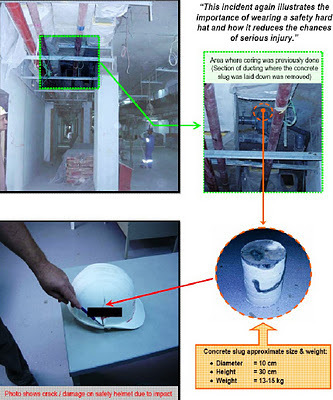 The piece of concrete fell from the ceiling height at approximately 2.5 m and struck the worker on the head, and then thru his shoulder where he sustained a minor injury. The concrete was identified as the slug from a coring operation from the floor above and was left on top of the ducting after the work was done. Weight of the coring slug is approximately 13-15 kg and having an approximate size of 30 cm long and 10 cm diameter. This incident could have been more serious if the concerned worker had not been wearing his safety helmet or hard hat as damage to it was substantial. No clean-up was carried out after the coring operation was done. The coring operative should have ensured that the piece of concrete was located and disposed of. No risk assessment in place for this activity- had there been one the above issue would have been addressed. Lack of proper supervision during the actual operations. Also, "human factors" whereby coring operative forgot to check for the coring slug final location to retrieve or there was deliberate omission of this. All activities should be properly risk assessed. The risk assessment must include hazard and risk to "others" not directly related to the coring activity and control measures included. Good housekeeping is the first law of accident prevention and should be a primary concern to all supervisors, foremen and the entire workforce. Safety helmet does protect you in cases like this and almost certainly protected the worker from a serious injury or possibly fatal consequences. Before each shift, a pre-start briefing should be done by supervisors or work in-charge. Glass panels were delivered in crates inside a container on back of a trailer to site unloading area. The container contained 6 crates each with 20 panels weighing approximately 80 kg each. First four were dragged out by team of five operatives to allow for telehandler to unload leaving two crates. Glass within one of these became unstable, toppled and 4 panels fell onto one of the operative involved in unloading and sustained fractures in his both feet. Wrong shipping method and poor crate construction. 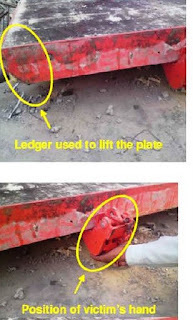 Inability to unload safety by mechanical means due to orientation of crates within container. No assessment of change and planning of safe method of unloading by contractor. No briefing given to operatives or risk assessment completed for manual handling and unloading. Supervision believed that method to be only option and did not ask for advice from the site team. Specify acceptable delivery method to enable safe unloading by mechanical means. Substandard deliveries should be quarantined until full review and safe method has been planed - If none then return it to the supplier. Risk assessment must be completed to ensure controls are identified for handling, offloading and storage onsite. Operatives MUST always be briefed on safe method. Care must be taken at all times as loads may have shifted, and become unstable or damaged during transit. Forklift and telehandler operatives must be competent and have checked all slings and lift accessories etc., prior to use. On site supervision should ensure no unloading takes place where there is doubt about the safety of method statement. "If in Doubt, STOP, and Ask." A 400 kg steel shutter which was placed on the ground was required to be lifted. The banksman, noticed that he could not insert the lifting gear hook onto the lifting point because it was too close to the ground. What he did, he instructed a fellow worker to insert a ledger beneath the frame and to lift it a few centimeters for him to attach the hook. While the worker is trying to attach the lifting gear, the shutter slipped off the ledger trapping and fractured the worker's left hand finger. The accident occurred due to an unsafe act on the part of a competent banksman. Ensure manual lifting of heavy loads is avoided. Ensure proper stacking stands are provided for all material stored on site or placed on wooden pieces to prevent accidental shifting of material. Ensure the risk assessment and method statement addresses all possible hazards relating to the task being undertaken. Ensure adequate toolbox talks are provided to workmen on the dangers and risks involved in manual lifting of loads. Ensure competent supervisor to carry out inspection of the specific task relating to the activity prior to lifting. "Placement of the shuttering should be on blocks so lifting points don't get blocked." A 500 tonne mobile crane was lifting a "Megashore 'A' Frame" to level 8 to allow the works to continue. While the 'A' frame was being lifted, a foot plate located on the bottom of the leg of the 'A' frame caught the underside of a 3.6 m RMD beam. The beam was positioned in 2 'U' heads on the rapid shore tower. The collision caused the beam to lift out of the 'U' heads and fall to the ground floor level, into a barricaded area. There were no injuries. Riggers are not vigilant during the lifting operation. Beam not secured during erection process as required by the drawings. Briefings were not conducted on correct method of erection. All slim shore beams are to be secured to the 'U' heads during installation. Supervisors are to be ensure that Tool Box Talks (TBT) must be carried out on correct method of operation prior to shift starting. All sites are to be undertake a review on all lifting operations to ensure work method statements and risk assessments are relevant to the operation and that riggers and scaffolders are following the erection process. Riggers to receive Tool Box Talks (TBT) regarding the need to remain vigilant throughout all lifting operations. "Banksman needed for crane sightings and operational assistance, lifting plan to be in place, supervision required during operation. Lifting plans should cover rigger duties. Lifting plans to be documented and approved by competent person prior to lift taking place. Competent supervisor with knowledge of lifting practice to be present during lifting operation. Competency of Riggers to be regularly assessed."